The three small cubic zirconia stones at the top of the cross represent the virtues of faith, hope, and love. The greatest love ever shown is exemplified in this tri-color gold adaptation of Christ's death on the cross. Made in fine-quality 14k solid yellow, white, and rose gold. Measures approx. 1 5/8" tall by 1 1/8" without hoop / bail. With hoop / bail measures 2 1/8" tall. 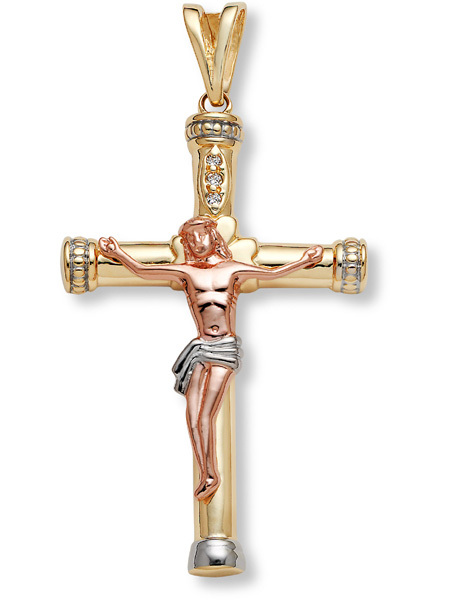 We guarantee our 14K Gold Tri-Color Crucifix Pendant to be high quality, authentic jewelry, as described above.